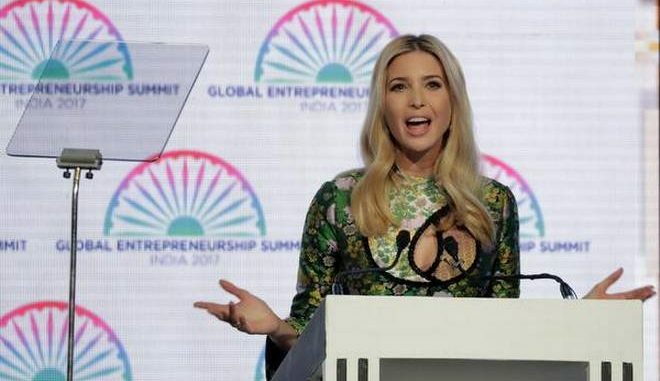 HYDERABAD: Ivanka Trump, US President Donald Trump’s daughter and advisor to the White House, today said Indian economy can grow by over USD 150 billion in the next three years if it was able to close the labour force gender gap by half. In her keynote address at the 8th annual Global Entrepreneurship Summit (GES), she showered lavish praise on Prime Minister Narendra Modi who is “doing to build India as a thriving economy — a beacon of democracy — and a symbol of hope to the world. What you are achieving is truly extraordinary”. “What you are achieving is truly extraordinary… from your childhood selling tea to election as India’s Prime Minister,” she said. “Through your own enterprise, entrepreneurship and hard work, the people of India have lifted more than 130 million citizens out of poverty — a remarkable improvement, and one I know will continue to grow under the leadership of Prime Minister,” Ivanka said further. “Here in India, I want to applaud Prime Minister Narendra Modi for his firm belief that ‘the progress of humanity is incomplete without the empowerment of women’,” she stressed. India, she said, is one of the fastest growing economies in the world and has a true friend in the White House.